A 60-year-old Caucasian male noted a red lesion on the right lower eyelid which was growing over 3 months. He revealed previously treated cancers of the colon, ureter, and skin, all under control without recurrence. He also noted previous eyelid surgery 2 years ago revealing a well-differentiated sebaceous carcinoma. Family history disclosed multiple members with skin and colon carcinomas. On examination of the patient, visual acuity was 20/20 OD and 20/30 OS. 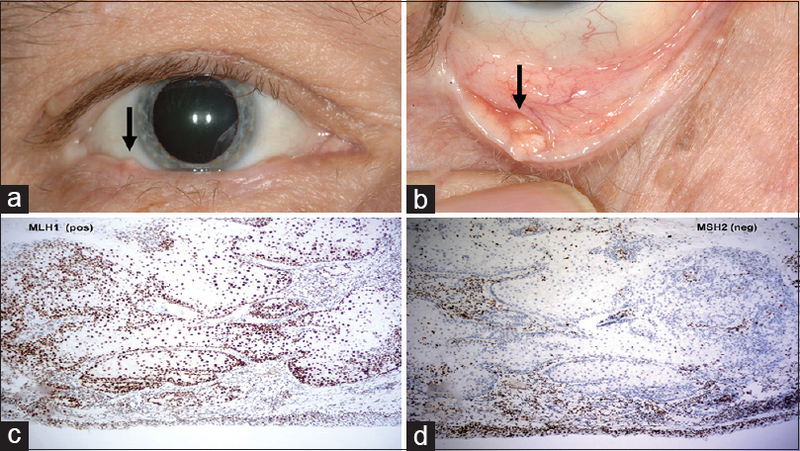 There was an elevated, lightly colored cutaneous lesion on the right lower eyelid margin, temporal to the site of the previous biopsy and measuring 6 × 4 × 3 mm. Shave biopsy of the lesion and follow up in 3 months. Wedge resection with immunohistochemical testing for Muir-Torre syndrome (MTS). Close monitoring with daily applications of hot compresses and topical corticosteroid ointment. Test for Gorlin–Goltz syndrome and proceed with photodynamic therapy. A pentagonal eyelid resection of the mass [Figure 1]a and [Figure 1]b was performed. Histopathology revealed a low-grade sebaceous neoplasm most consistent with sebaceous adenoma. Immunohistochemical testing for DNA mismatch repair proteins in the excised tissue demonstrated normal staining for MLH1 [Figure 1]c and abnormal absence (lack of staining, mutation) for MSH2 [Figure 1]d. These findings were suggestive of underlying MTS. Sebaceous adenoma in the setting of MTS. MTS is a rare variant of Lynch syndrome found in <1% of the population. This syndrome is clinically suspected by the occurrence of both a visceral cancer, usually involving the colon or genitourinary system, along with cutaneous sebaceous neoplasms. This constellation of neoplasms is typically multiple, occur at an early age, and are generally histopathologically low grade. Colorectal carcinoma is the most common primary malignancy, found in approximately 51% of MTS patients and generally localized proximal to the splenic flexure. Other common internal malignancies include cancer of the endometrium, ovary, and uroepithelium which make up 24% of cases. Mismatch repair gene mutations in MLH1 and MSH2 spawn the development of various neoplasms. Acknowledgment to Dr. Tatyana Millman and Dr. Ralph Eagle for their contributions to histopathology photomicrographs. Lee JB, Litzner BR, Vidal CI. Review of the current medical literature and assessment of current utilization patterns regarding mismatch repair protein immunohistochemistry in cutaneous Muir–Torre syndrome-associated neoplasms. J Cutan Pathol 2017;44:931-7. Schwartz RA, Torre DP. The Muir-Torre syndrome: A 25-year retrospect. J Am Acad Dermatol 1995;33:90-104. Jagan L, Zoroquiain P, Bravo-Filho V, Logan P, Qutub M, Burnier J, et al. Sebaceous adenomas of the eyelid and Muir-Torre syndrome. Brti J Ophthalmol 2015;99:909-13.